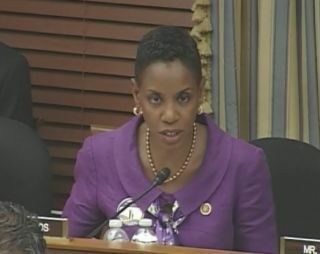 Speaking during a House Committee on Science, Space and Technology meeting July 18, 2013, Rep. Donna Edwards (D-Md.) opposed budget cuts outlined under a Republican-proposed NASA authorization bill for fiscal year 2014. House lawmakers debated NASA's 2014 budget today (July 18) during a meeting that saw stark partisan divisions over proposed funding cuts for the agency's science and space exploration programs. A NASA authorization bill drafted by the Republican majority of the House Committee on Science, Space and Technology proposes to slash NASA's funding to $16.6 billion for 2014 — $300 million less than it received in 2013, and $1.1 billion less than President Obama requested for NASA in 2014. The bill — which authorizes spending levels but provides no actual funding — would roll back NASA’s funding to a level $1.2 billion less than its 2012 budget. "It is a bad, bad bill," said Rep. Eddie Bernice Johnson (D-Texas), the committee's ranking Democrat. "The bill were considering today will hurt the NASA centers and work force, cripple the agency's ability to carry out all the responsibilities the nation has given it, and put NASA on a path of mediocrity. It gives me no pleasure to say this is a terribly flawed piece of legislation." Republicans insisted the bill provided enough money for NASA to achieve its main objectives, and said it was realistic, given the tough fiscal circumstances. "Everyone on this committee would like to see more funding for NASA, but we must do the best with the hand that we have been dealt," said Rep. Steve Palazzo (R-Miss. ), chairman of the House Science space subcommittee. Numerous committee members submitted more than 30 proposed amendments to the bill, including an amendment put forward by Rep. Donna Edwards (D-Md.) that would boost NASA's 2014 funding to $18.1 billion. "This amendment provides a pragmatic path forward," Edwards said. "The reality is that NASA should be funded at levels that are actually billions of dollars more than I am proposing." Edwards disputed the claim that the committee was obligated to pass a NASA authorization bill in accordance with sequestration cuts. The House of Representatives separates the job of authorizing federal agencies from the job of appropriating money to those agencies, she maintained, so that the authorizing committee could set a vision and authorize funding appropriate to achieving that vision. "Funding NASA, our nation's crown jewel, at sequestration levels is a choice — it is not our legal requirement," Edwards said. "It's a choice that I can't support." In particular, she and other lawmakers objected to harsh cuts proposed in the authorization bill to NASA's Earth science program, space technology initiatives, heliophysics program, and other projects. But Republican representatives resisted all amendments that aimed to increase funding beyond sequestration levels. "The tooth fairy isn't putting money under our pillow, and I would urge my colleagues to vote against tooth fairy funding," said Rep. Dana Rohrabacher (R-Calif.). Closing Marshall Space Flight Center? Democrats did propose some cost-cutting measures to accommodate the federal fiscal tightening. However, Edwards withdrew an amendment she planned to introduce that would study the possibility of closing either NASA's Marshall Space Flight Center in Huntsville, Ala., or its Stennis Space Center in Hancock County, Miss., and consolidating the rocket development activities at both sites in one location. The proposal met with harsh opposition by the committee's chairman Rep. Lamar Smith (R-Texas) and Rep. Mo Brooks (R-Ala.), and Edwards withdrew the amendment at their request. "Marshall and its work force have provided great value to our nation," Edwards said, but added that she felt compelled to examine all options for limiting NASA's expenses. Ultimately, though, she decided to withdraw the amendment "because I believe in the multi-mission function of NASA," she said. "I just don’t think it can be accomplished with the budget that's been outlined by the majority."